If you were to see me in a crowd, you may think that I don't look like I have kids- if they weren't hanging all over me. My clothes is put together okay (or at least I think so), you know my clothes is not yelling "Mommy alert". My purse on the other hand is! Today as I looked through my purse in the middle of a bible study class I had to chuckle because of the contents I had to rummage through to find my phone. My purses have definitely taken a new look now that I'm a mommy. Before they were cute and small, always small. Now they are big and lumpy. According to my son "I need it" everywhere I go. He won't let me walk out the door with out it. You will see why as you read. If you were to randomly open my purse you would find: cell phone, keys, coins, gum, at this point your thinking okay that sounds normal. Well it get's worse: candy wrappers, baby star finger foods that have fallen out of it's container, some kind of fruit in a baggie(today it was a whole grapefruit, Bob the builder undies (got to be prepared for those potty accidents), hot wheel cars, kid tattoos, gloves and scarf (you never know when a blizzard is going to hit in TX), coupons for Sonic, Chic-fil-a, McDonald's (all those wonderful healthy places to take your children to eat), baby wipes, first aid kit (just in case someone bleeds to death) and mosquito wipes. Depending on the time of the month you will find other necessities which Ethan tends to dig out at very inopportune times. Wow! I guess you could get stranded on an island for a day or two with my purse. Can't wait til he's into bugs and rocks. For some reason I think I will be sure to find them in my purse. What treasures does your purse hold? 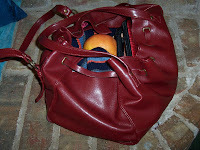 I found this blog post in my old website and had to chuckle because 4 yrs later my purse hasn't changed much. i just gave you the Versatile blogger award. you can check it out on my latest post.